We are only a few short weeks away from Valentine’s Day. Instead of waiting till the last minute and going out and buying all your cards, why not take the time now and make them? The kids can all join and make it a family time to make school valentines, grandparent valentines and friend valentines. When cards are made personal and you put yourself into them they mean more to most people. Creativity can be cheaper than buying, especially with the price of cards these days. So, get out your crayons, paper, scraps of ribbon, stickers and anything else you have that might go on a card. I have seen Jello used, elbow noodles, bottle caps, paper plates and doilies. Let the kids have fun! Do not make them do it perfect. Why not make your special loved one a card too? Take the time now, think about it and then by Valentine’s day you will be prepared, have saved money and will not be out there spending like the rest of the world. There are many other sites that offer free designs and ideas for a frugal but wonderful day. Your family can spend the time together and work together to make it special. 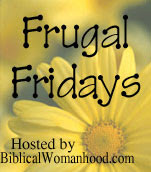 For more frugal ideas check out Biblical Womanhood. We made ours already! The kids and I made them a week or so ago – now we just need to buy postage (love stamps, of course) and post them to our out-of-town family and friends. The kids had so much fun – we got so much more out of it than buying a box of cards at the store. Since my kids are young, I invested a tiny bit of money ($20 or so) and bought a holiday stamping kit on clearance (for $19, down from $50!) that contained stamps and ink pads for all the holidays and birthdays throughout the year. It also contained alphabet stamps, which we get to use for learning our alphabet and spelling (we homeschool). In the long run, it was a very frugal thing to buy! I really love your sidebar statement, “Purpose For This Blog”. I totally agree with you that society is really failing, in churches and everywhere, in this respect. oh, I love family fun. They have such great holiday ideas! !